To make your choices easier, below is a quick gutter services guide to understanding how these key maintenance elements offer peace of mind while protecting your home from water damage. Your home is probably the single most important investment you will make in your lifetime. One of the best ways to protect this asset against the depreciating effects of water damage is to have an effective and well maintained gutter and leader system. Do not try to take matters to your own hands, since gutter cleaning and maintenance can be dangerous. Improperly drained rain water may cause severe damage to your home. Clogged rain gutters and overflowing leaders are two of the leading causes of rotting wood, leaky roofs and basements, cracks in the foundation, frozen sidewalks and soil erosion along pathways. The cost of gutter installation is insignificant compared to costly damage that can occur when the gutter system fails the home. We can help you protect your investment by cleaning or replacing ineffective gutters. Cleaning and installing gutters is our job. Let us give you a gutter installation estimate today! Gutters are manufactured in two styles to fit your home’s needs – K or half round. You may choose from aluminum or copper gutter material to suit your home’s design, style and budget. Visit our project page to get ideas for your home. Traditional “K” Style Gutters– named for its shape, this style is commonly used in residential and commercial applications. The sturdy design easily manages the heaviest of downpours from rainstorms. Its heavy duty capacity allows rainwater to drain safely away from your home’s foundation, eliminating the potential damaging effects from overflowing downspouts. Half Round Gutters – This classic style adds an elegant look to homes constructed of either stone or brick. It is well suited for the homeowner desiring to maintain a homes’ historical integrity. Leaders are available in different shapes and sizes to meet the home’s architectural requirements as well as your personal taste. As a professional Gutter installation company we can help you choose from either rectangular, corrugated or round leaders in standard dimensions of 2”x3” or3”x4”. Visit our Project Page to view some of the gutter solutions that gave our customers peace of mind and renewed pride in their home’s appearance. Contact us for a free estimate and inspection! Thanks for your interest in NjGutters™, the #1 consumer-rated gutter guard system. Please fill out the form below to request a free estimate. Then, one of our friendly customer service representatives will reach out to you shortly. 15% off for first time customers! NJ Gutters is a family owned and operated business since 2004. 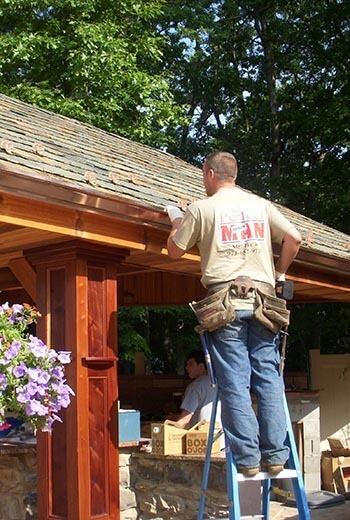 Our experienced craftsmen deliver personalized attention and workmanship to ensure your gutter system blends with your home’s unique design while resolving critical drainage issues. Copyright © 2017 NJ Gutters All rights reserved.